with groove for easy handling. • Ready for use with Acrylic Mounts. • Mount is NOT included. • The rubber stamp part only. 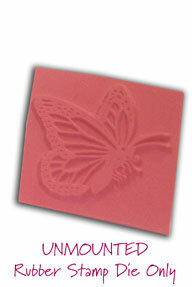 • Untrimmed, roughly cut out stamping die. • Mount/Mounting Supplies are NOT included. • The clear polymer stamp part only. 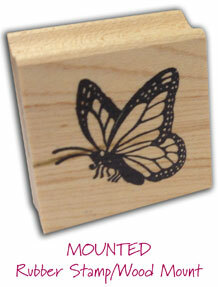 You can mount your own stamps exactly the same way we do. You may choose to cut your own wood blocks, or have someone cut them for you. The wood mounts are available in 12" strips of unfinished hard maple. 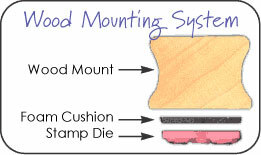 We also sell our double stick foam mounting cushion. We have found this product to be a superior adhesive, and it is convenient to use. 1. Peel off one of the protective sheets from a piece of mounting cushion. Press the stamp die onto the cushion. 2. Trim close to the image with a sharp scissors angling the cut away from the die. The black cushion should extend beyond the die slightly. 3. Remove the remaining piece of protective backing from the cushion. Firmly apply to the wood block. ENJOY! 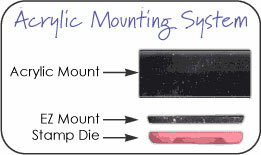 This temporary mounting system is growing in popularity as a space and a money saver. You will need to purchase several sizes of acrylic blocks; but once you have made this initial investment, you will not need to continue buying mounts for each stamp. 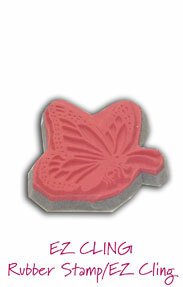 You will save storage space because you will have only rubber stamp dies to store. You may choose to file them in envelopes, magnetic photo albums, etc. TIP: If the stamp die doesn't cling well to the acrylic mount, clean the surfaces of the EZ Mount vinyl and the acrylic mount with window cleaner and dry well. 1. Peel off one of the protective sheets from a piece of mounting cushion. Press the stamp die onto the cushion. Trim close to the image with a sharp scissors angling the cut away from the die. The cushion should extend beyond the die slightly. 2. Remove the protective backing from the cushion. 3. Temporarily mount the stamp die onto the acrylic mount. The stamp die will "cling" to the acrylic mount surface. ENJOY!